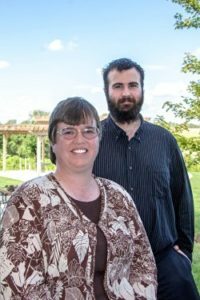 Today’s Friday Five focus is Charles and Wendy Siefken, authors of young adult fantasy short stories and novellas. Wendy and Charlie are a mother and son writing team who started their career doing a school project. Five years later, Charlie has graduated high school and college they are still publishing and still writing. Their latest work is Kai’s Journey, a trilogy about a young man, set ten years in the future. Kai has spent those years fighting for survival and trying to find a way rid the world of the disease his father created. His father was a military scientist charged with the task of perfecting a formula that would create a superior breed of soldiers. Like a virus, it soon spreads to the entire world, unleashing a period of unsurpassed chaos and conflict. They come from everywhere. It could be a character off of a video game, or a side character out of a book or even something from a dream. Wendy’s is “Home” because all it means to us. Home represents a safe haven, love, family and comfort. Charlie’s is “Dragon” because of the images the word alone conjures. 3. What do you want your tombstones to say? 4. How much of your published writing is based on personal experiences? None, there are no zombies, dragons or werewolves in real life. At least not yet. 5. What author has influenced your writing style/subject the most and why? A combo of Terry Brooks, Rick Riordan, and Christopher Paolini. We really like their writing styles and there always seems to be hope in their stories. Charlie really liked that Christopher Paolini was a published author by the time he graduated high school. Charlie strove for that and succeeded. Kai’s Journey is currently available through Amazon.